Your data is important and you’re not the only one. As more and more companies and individuals need their data stored by safely and securely the old models of doing this have evolved into the Colocation Center. Colocation facilities provide space, power, cooling, and physical security for the server, storage, and networking equipment and connect them to a variety of telecommunications and network service providers—with a minimum of cost and complexity. That’s good for you and good for us. 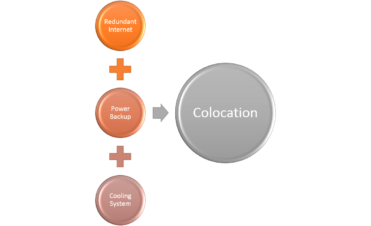 There are so many benefits to a colocation center it isn’t easy to list them all quickly. With redundant internet you're ensure of always have access to the internet. That's a good thing. It the hosting world things go wrong and redundancy with vital business operations like internet access is not a perk, it's a base requirement. We have an in-building Ameren substation meaning that losing power to the building is a remote possibility. In addition we have a Caterpillar 600 kW 750kVA generator in case of catastrophic failure. Power outages are a major threat to any hosting service and having an in-building source is a huge advantage. In addition to cooling there is a highly efficient fire-suppression unit installed which means even more security. All these features simply mean the servers your data is stored on are physically safe from damage and always connected to a power source. This means you’ll have access to your data at all times. Colocation is a fancy word but it just means that our servers are hosted at a site that is as best protected as possible. If the power goes out, if there is a fire, if the heating goes out in the building, we’re covered and that means your business critical servers are working and providing you with data.